When you receive a donation, your donor needs a receipt and it's best practice to acknowledge you received their donation and thank them for their contribution! The following steps will show you how to print a letter and receipt to your donor, to be mailed at a later time. Method provides stock templates for receipts and emails, which are set up in your App preferences. It is highly recommended you set up those preferences before you use this app. Feel free to edit the thank you letter in the field on this screen. This only affects this letter and will not change the original template. The way your letter and receipt looks is based on the stock templates we've included in Method. If you want to create your own letter and receipt templates, you must use Method's Report Designer tool, but please note this is an advanced tool not recommended for new users. 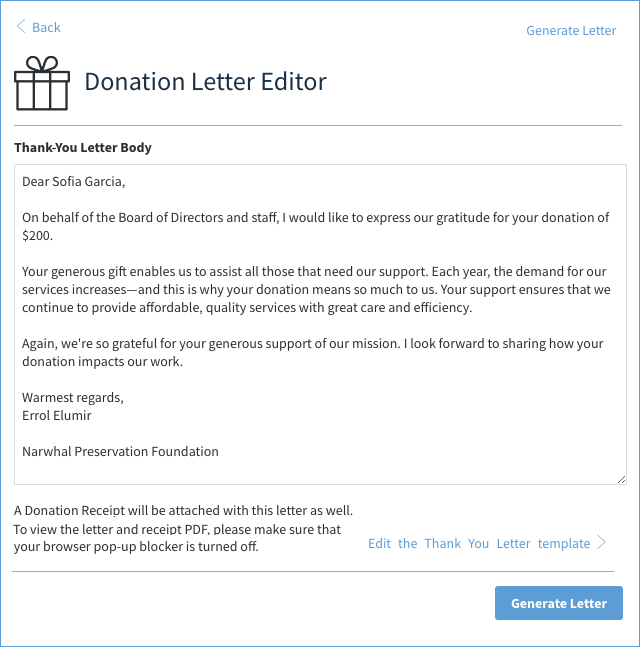 When you are satisfied, click Generate Letter. This opens a pop up of the PDF of the letter and the receipt. NOTE: If a new window does not appear, pop-ups may be blocked. Pop-ups MUST be enabled for Method on your browser, or the letter will not appear. From the pop up screen you can print or download the PDF to print later. You are then returned to your Method dashboard. 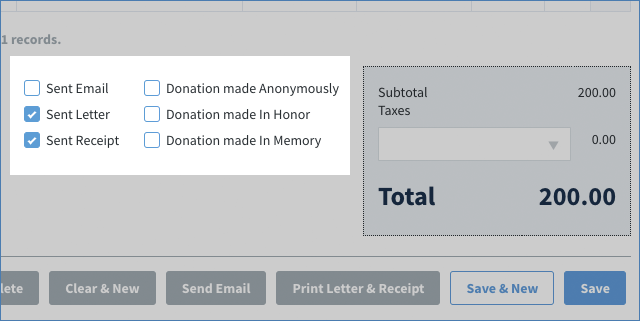 If you view the existing donation, the Donation Notes section is updated to indicate that you have printed a thank you letter and receipt for this donor. If, for some reason, your donor does not receive the letter and/or receipt in the mail, you can re-print it at any time by following these steps again.